Peter Holmstrom writes an in-depth article for MysteriousUniverse.Org that celebrates the 45th anniversary of the ordinance that protects Bigfoot in Skamania County. The Bigfoot flap of 1969 began in March, when John and Linda Durrell were driving up with their family on a camping trip above Carson, Wa. Nearing their destination, Linda Durrell spotted something of the side of the road. Getting out to take a look, she was surprised to see extraordinarily large footprints in the snow, far larger than any human could have made. Read the full article at Mysterious Universe, "The Bigfoot Law: Celebrating 45 Years of Safety"
Although it seems the the female was already expecting something before the camera began rolling, it still is an interesting video, that is sure to make the rounds within the next week. The YouTube account does not give names or the exact date of the encounter, it was published on June 18th 2014. We have reached out to the user attached to the video AnythingWhatever and at the time of this post we have not heard back from them. They do seem to be somewhat savvy YouTube users, they provide Links to the stabilized and slowed sown version of the videos in the description and embedded in the annotations as well. Below is the description followed by all three videos. We were driving near Sundance Utah just outside of Provo Utah in the Provo Canyon. We saw something in the trees so we turned around as quickly as possible. We captured this footage of what might be a bigfoot or sasquatch. Debate.org is a free online community where intelligent minds from around the world come to debate online and read the opinions of others. 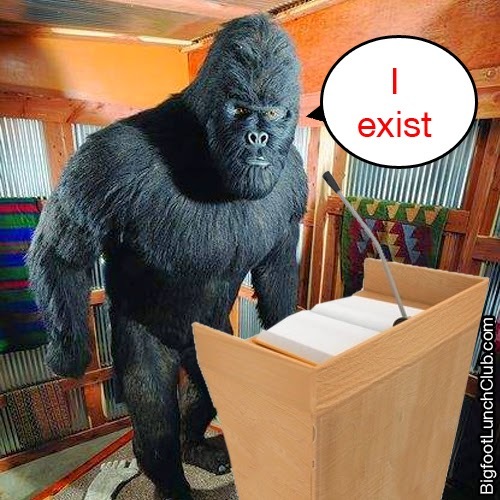 Yesterday, June 18th 2014, DonutBoy17, a Debate.org user, claimed he would be able to provide evidence Sasquatch does not exist. Another user, RainbowDash52 is the opponent and arguing for the existence of Bigfoot. This is a five round debate and as of today they are deep into the third round. Read the debate so far with a link to see how the debate ends. I will provide evidence that Sasquatch does not exist by using facts, scientific data, opinions, and just plain common sense. I will provide a few reasons and points that support my argument each round as well as rebuttal points made by my opponent. The opponent may use the first round argument however he/she pleases. In the past there have been several animals that were believed to be mythical that turned out to actually exist, including the Okapi (African unicorn), the Giant Squid (Kraken), the Gorilla, and more. 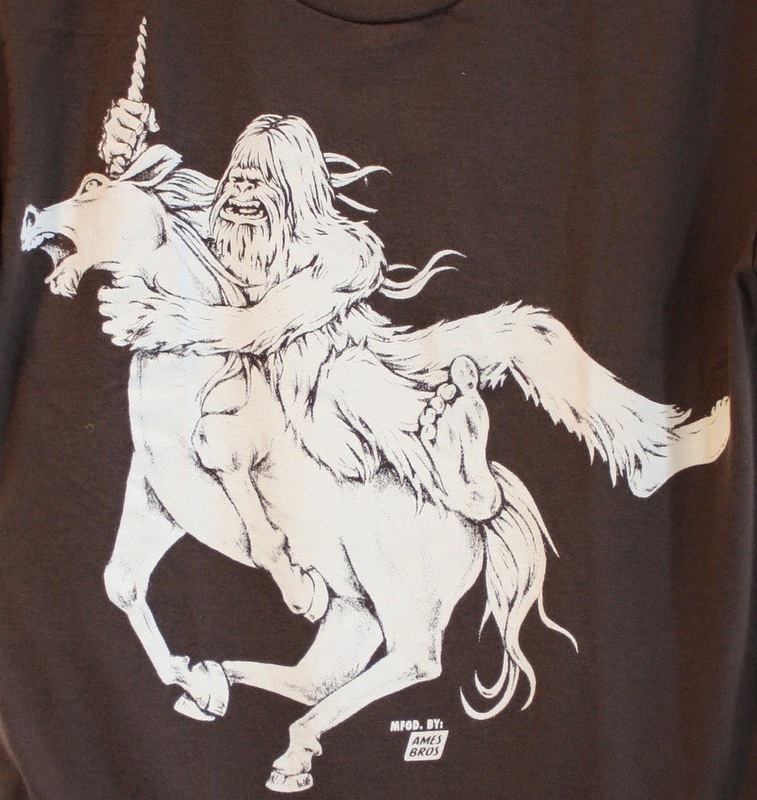 Since it is often the case that creatures whom many believed to be fictional actually exist, it would be logical for Bigfoot to exist. This in addition to the abundant number of Bigfoot sightings is more than enough for there to be at least a reasonable chance that Bigfoot exists. DonutBoy17:It is true that species such as the Okapi, Giant Squid, and Gorilla weren't believed to exist and then turned out to be real. But lets look a litter closer at this fact. The Okapi and Gorilla were believed to be mythical until their discovery in 1901 and 1902. Those discoveries happened over 100 years ago when our scientific and technological abilities were far less capable. The last land animal discovered that was around the size of a gorilla was probably the Giant Panda that was discovered in 1927. Since 1927, all the animals that have been discovered have been either relatively small, microscopic, or aquatic. Your Giant Squid argument is almost irrelevant because the amount of sea creatures discovered in comparison to land animals is very small. Anyways, with todays technology, it is nearly impossible for a species (Sasquatch) to remain hidden from a highly populated country for so long. If Sasquatches really did exist all throughout America (not including Hawaii) there is no way that the only potential evidence that had been found is footprints and blurry videos and pictures. Footprints and pictures are way to easy to fake and are not enough evidence to prove the existence of a species. Most of these footprints, videos, and pictures are later admitted to be hoaxes. The most famous video of Sasquatch is the iconic footage of the creature walking through the woods with big strides filmed by Roger Patterson. This footage was later admitted fake by Bob Heironimus who said he was paid $1,000 to walk in a gorilla costume while filmed. I will cut this round off here and provide more facts in the next round. One of the reasons for why Bigfoot could be hard to detect would be because Bigfoot is nocturnal, which some speculate he is . It is harder to find animals that are mainly active during the night. Bigfoot is also smarter than most animals, so it could be able to use its intelligence to hide better. These factors could contribute to its evasiveness, so it may be the case that Bigfoot is harder to find than other animals. My opponent claims "Anyways, with todays technology, it is nearly impossible for a species (Sasquatch) to remain hidden from a highly populated country for so long." As you can see here , there are large sections of the United States that are not very populated. A population of Bigfoot could easily live there unnoticed. Although Bob Heironimus admitted to help fake the Patterson film, it has not been proven that that what he admitted is true. My opponent claims most evidences for Bigfoot are later admitted to be hoaxes. Although some are, I doubt most are. I challenge my opponent to give a source supporting his/her claim. Although all footprints, pictures, and videos have the possibility of being faked, that is the reason there is no proof of Bigfoot, because people can't tell the real evidence from the fake evidence. The first thing I want to do before arguing my case is to clear up a mistake made by myself in the previous round and was also pointed out by my opponent. Bob Heironimus was said to have been paid $1000 to walk in the gorilla suit, but Bob claims that he did indeed walk in the suit, but was NOT paid any money to do so. My opponent says that Bigfoot could be hard to detect because they are nocturnal. So you are saying that humans can't find Bigfoot because it's dark outside? We have infrared technology and night vision goggles that eliminate this problem. Or people could just search for them when it is daytime. Just because Bigfoot may be nocturnal doesn't mean that they disappear during the day time. And also it would probably be easier to find Bigfoot when he is sleeping and can't be "evasive". In America we have the technology, skill, and intelligence to track down a person hiding anywhere in the country, but yet you think that we can be outsmarted by thousands of wild gorillas? It just isn't logical. Metro Times is a weekly alternative news source for the Detroit Area. On June 17th 2014, contributing author, Alysa Offman, offers some great advice for the aspiring bigfooter. To some sage bigfoot field researchers, there may be a few essentials missing, but overall it is a great introduction to getting your feet wet. read an excerpt below followed by a link to the original article. With dense forested areas, swamps, vast farmlands, and access to plenty of fresh water, Michigan seems an ideal and idyllic setting for a bigfoot. He and his ilk have been seen as far north as the Upper Peninsula and as far south as Monroe County, with new occurrences happening regularly. Far and away, Oscoda County has the most bigfoot sightings on record in Michigan. Starting in 1976 when a child saw a “6 to 7 foot bigfoot near the Mio Dam” while walking home from school, the bigfoot sightings have since increased, with most occurring near Mio. Jackson County comes in at a close second, with incidents occurring in a concentrated block from 2000 to 2005. Washtenaw County isn’t far behind Jackson’s count; sightings have been happening regularly since 1957. There’s some debate as to whether or not bigfoot are dangerous. While some researchers paint the creature as a bloodthirsty being that seeks the flesh of women and children; others have reported that sasquatch are generally kind creatures who’ve shown as much curiosity toward humans as we have toward them. We would like to see some plaster added to the list. If you have anything to add please leave your suggestions in the comments below. 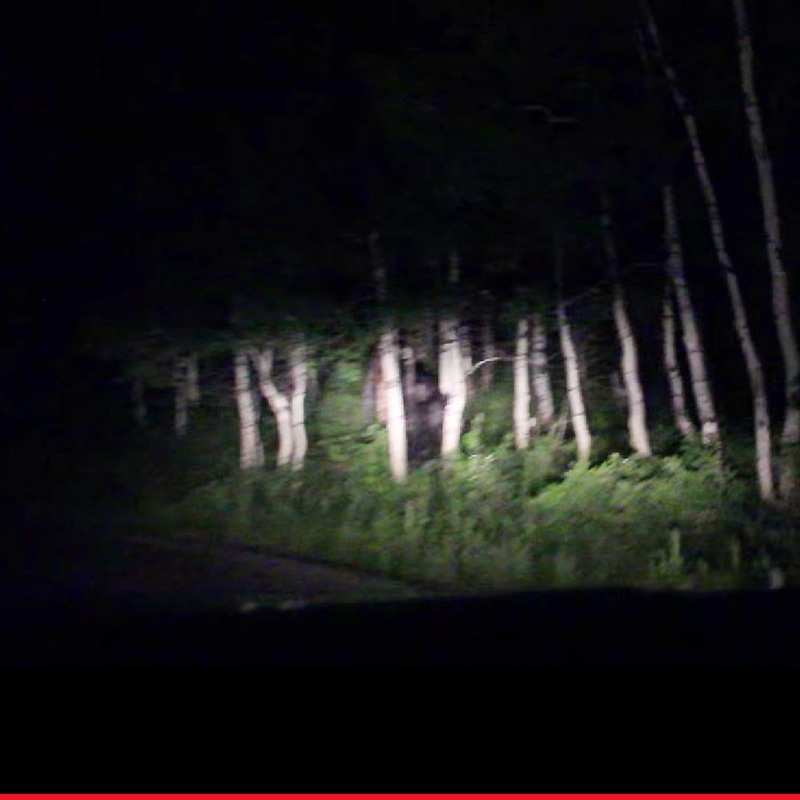 Read the what else Alysssa suggests when Bigfooting in Michigan. This video is one of several exclusive webisodes where the stars from Call of the Wildman watch classic movies and review them. 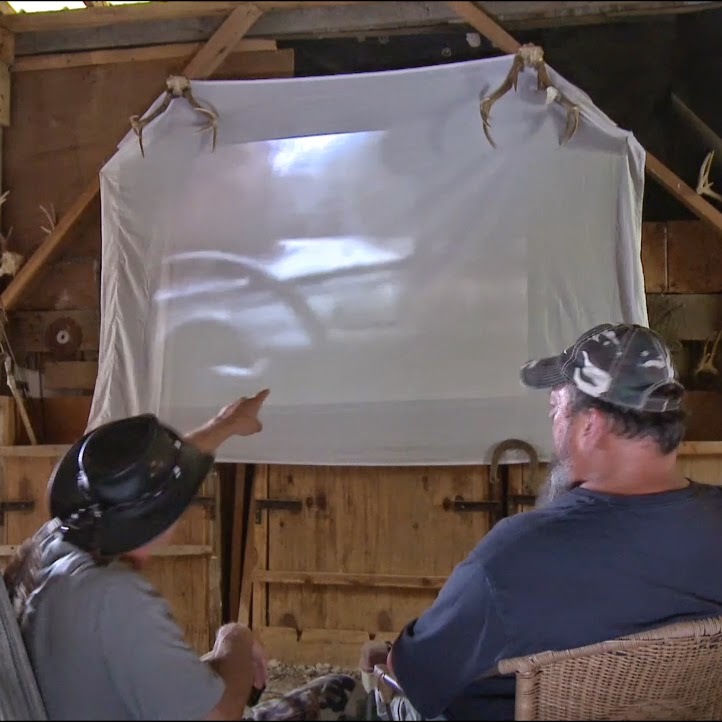 Each episode takes place in the cine-barn where the is projected on a bedsheet pinned up by a couiple of antlers. In this particular episode Turtleman and his side-kick Neal watch and review one of the most legendary Bigfoot movies of all times; The Legend of Boggy Creek. The Olympic Project Bigfoot Expeditions are incubators for sharing sasquatch research innovations and ideas. this last expedition with Dr. Jeff Meldrum and premier cryptozoologist Adam Davies was no different. We have plenty of bigfoot news and other material to provide you with this week from the expedition, including Adam Davies' methodology for creating an interaction and perimeter with a Bigfoot. 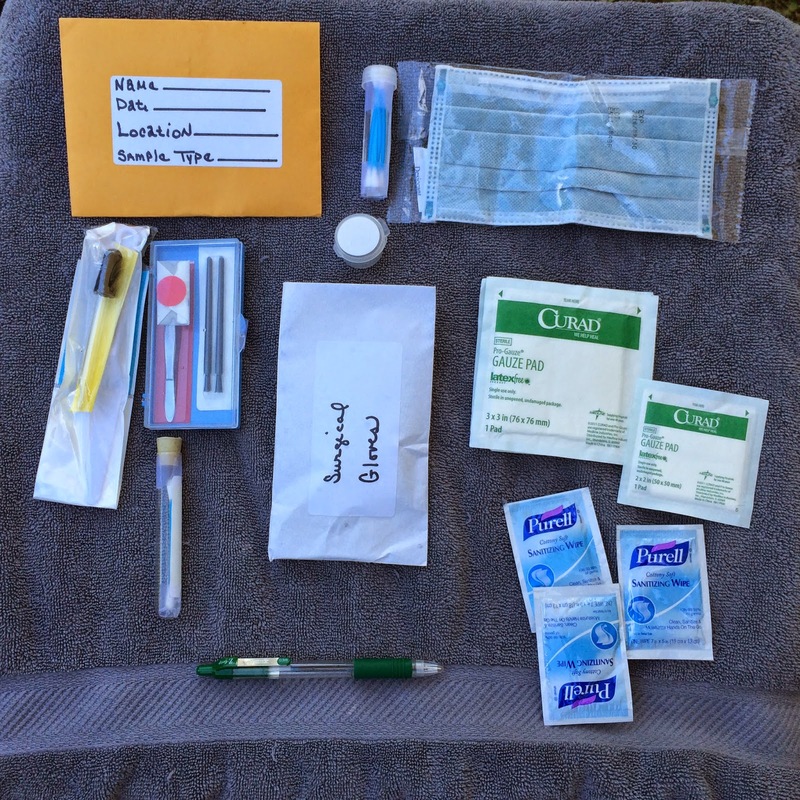 For now, we wanted to share one of the most thoughtful tools in bigfoot research, a wildlife DNA collection kit. Shelly Covington co-hosts CryptoLogic, an online radio show that has introduces a special guest each episode and has a round-table approach to the format. As you can imagine I listen to lots of Bigfoot talk shows, I just spent the last two days catching up to CryptoLogic and became an instant fan of the approach and format. I also want to give a shout out to the other co-host Shane Corson. between Shelly and Shane, CryptoLogic is not to be missed. When talking to Shelly, who has endless innovative ideas and approached to bigfooting, explains why she prefers to leave bigfoot out of the name of her kit. "I don't call it it a Bigfoot DNA collection kit, it's a wildlife DNA collection kit, when doing research, we shouldn't assume all the evidence we find is bigfoot, bigfoot should be the last thing we assume." Below is a video of Shelly walking through her DNA collection kit at the end of the video is Cryptozoologist and Autor Adam Davies giving his approval. 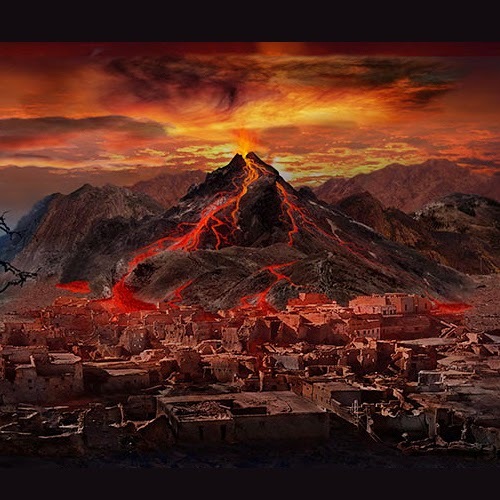 Can we demonstrate Bigfoot migration based on natural disasters? After the ecosystem of Mount St. Helens recovered, many plants and animals returned, evidence suggest Bigfoot did not--at least in the numbers that once existed. You will not want to miss this HopsSquatch. You will see compelling evidence that Bigfoot has migrated! Using seven independent databases, the dates of natural disasters and the history of human infrastructure, Colleen Meacham has been able to determine several insights to Bigfoot behavior and habitat. Like any living thing, Sasquatch needs a place to live, breed and raise a family. In Environmental Sciences we call this a habitat. In order to address the needs of Sasquatch we need to understand their habitat and their place in the ecosystem. 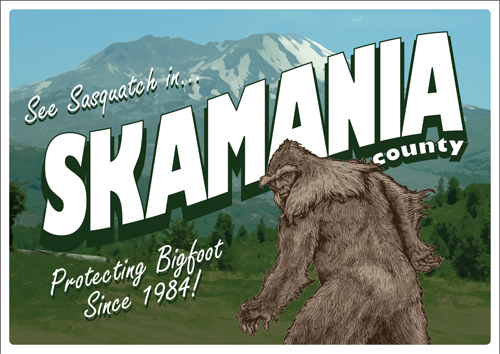 The project that will be presented will explore potential Sasquatch habitat. The presentation will also look into if changes to the habitat from human interference or natural disasters can affect the behavior of Sasquatch. Finally, are we in danger of loosing Sasquatch before we've found them? Bigfoot in Malyasia is a hot topic today. We already had another Malaysian paper defend Bigfoot from being a myth. Another paper, the Rakyat Post, actually reports on an actuall encounter filed my the police. Read the article below. It seems that residents at Kampung Seri Aman Dalam, Puchong, might be worried about a close encounter of the giant kind after a resident found four huge footprints that measured 23 inches long. This is yet another incident that was brought to light after a police report made by the resident began circulating online. 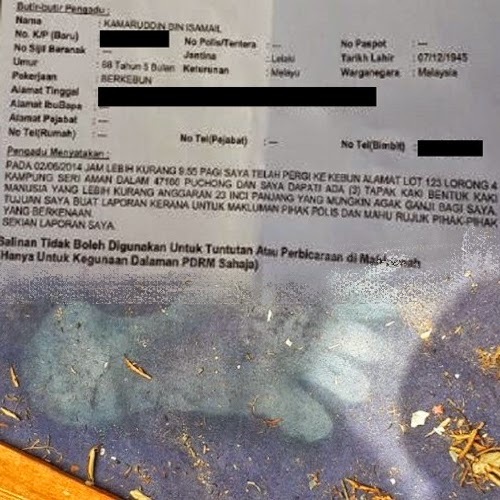 The report, made by 68-year-old Kamaruddin Isamail, mentioned the discovery of the giant-sized footprints near a field at Lot 123, Lorong 4, Kampung Seri Aman Dalam in Puchong at 9.55am this morning. He stated in his report that he saw three footprints in the shape of a human foot, which measured up to 23 inches long, that “seemed rather weird” to him. When The Rakyat Post contacted Kamaruddin, he confirmed making the report and said there were actually four footprints, but only three of them were clearly seen. He said upon making the report, which he did because it was an unnatural occurrence, he was visited by a police sergeant after which he called officers from the Department of Wildlife and National Parks (Perhilitan). “Perhilitan came to see me. Even they said they had never seen such a thing and couldn’t determine what kind of print it was. “It’s weird and it is something very worrying,” added Kamaruddin. When asked what he thought it could be, he said he had heard of stories about giants and genies, but he did not know them to be true. When contacted this evening on the issue, Serdang district police chief Assistant Commissioner Razimi Ahmad told The Rakyat Post that he wasn’t aware of the incident at the time. However, a quick call to the Bukit Puchong police station where the report was made, confirmed that the report was genuine and was lodged by Kamaruddin this morning. Meanwhile, Kamaruddin said he was to meet the village committee tonight on the incident to find out if such a footprint was real and perhaps shed light on what it could be. The New Straits Times, a Malaysian paper, makes several arguments of many ideas that were once thought as myths have turned out to be real. For example, take the ancient city of Dwaraka in India. Although it was recorded in Hindu scriptures that Sri Krishna ruled over Dwaraka and it was later swallowed by the sea, it was dismissed as myth. Since the discovery of an ancient city under the sea by archaeologists at the place where the scriptures stated Dwaraka to be, it transformed myth into history. Similarly, there may be a species of Bigfoot in Johor that existed many years ago. During the 1960s, I had the opportunity to discuss this subject with a Tibetan Buddhist monk. According to him, Bigfoot or Yeti, did exist in the Himalayan area. Tibetans monks have frequently seen the Yeti. He had said the Yeti looked like an ape but their skulls appeared humans, and they walked like humans. They possessed large and strong teeth. Their feet and hands were large, while their arms were much longer than normal humans. As Tibetan monks respected nature, the monk told me the Yeti had attempted to communicate with them by making noises that were similar to cats. He also said the Yeti was not an animal. It seemed human and perhaps evolved separately from us. However, a danger does exist if frequent footprints of the Bigfoot are found around human habitation. It may either mean the Bigfoot is short of food or it is intending to mate. 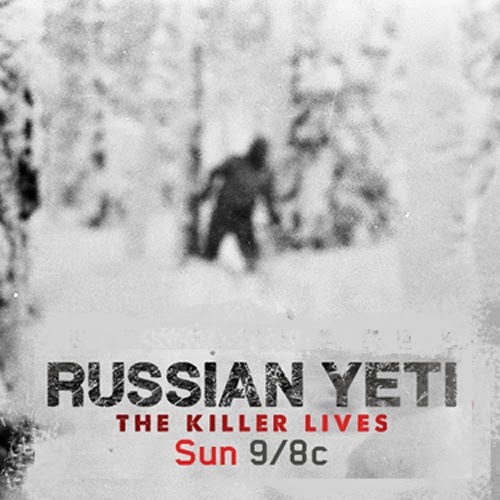 There have been reports of the Yeti abducting women in Tibet.